Starting with HEMA Holographic Copper, 3 coats, no base/top. The polish itself applied nicely, I like the smaller brush, but it's one of those holos where you have to be a bit careful to not drag the previous coat along. So it applied slightly patchy when I rushed a little, and I'd definitely use it with a holo basecoat next time. 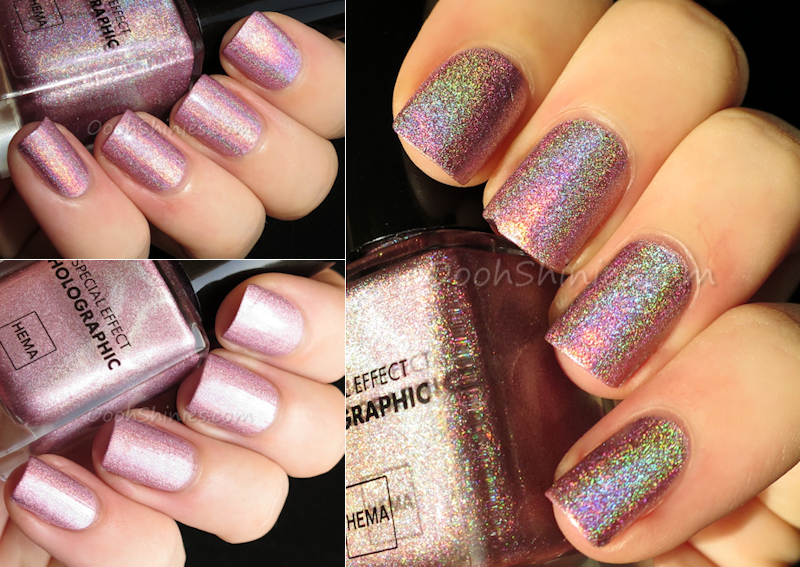 Next we have HEMA Holographic Pink, again 3 coats without base/top, same application as described above. The sunlight was a bit warm here as you can see on my skintone as well, further below I added a photo made with flash, to show the sweet color a bit better. 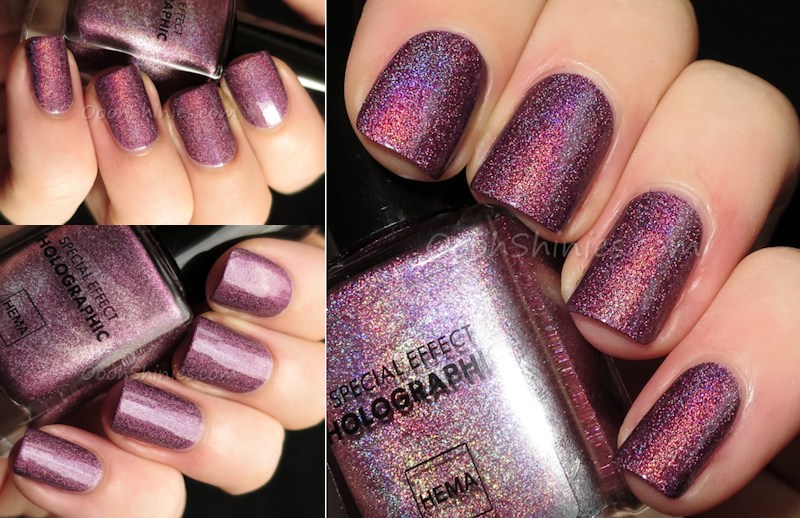 And last, my favorite of them all so far, HEMA Holographic Bordeaux. 2 coats, no base, with top coat. As you can probably tell by the length of my nails, I've swatched this before some time, so I don't have any sunlight photos of it now. This one applied the best, 2 easy coats, no issues with pulling patches. But it did dry up less shiny than the others, so I did use top coat when I swatched this one. 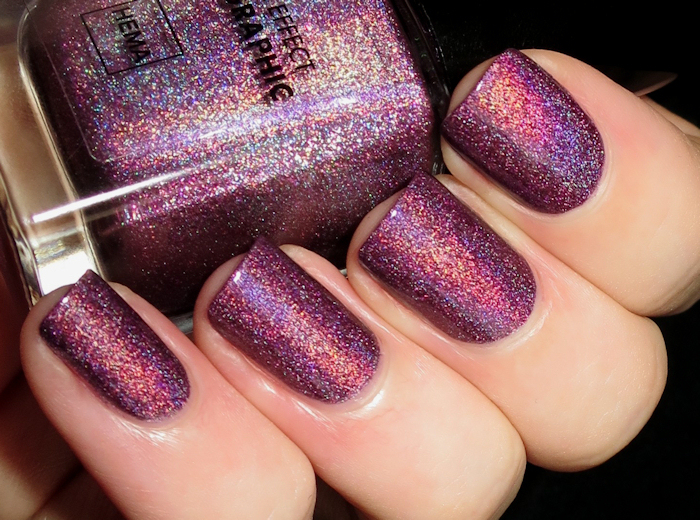 It's a red based purple with pretty strong holographic effect, but the effect seems a little more scattered than the other polishes that I tried so far. Considering the size/price of these bottles and the effect of them, I hope HEMA will add more holos in the future!